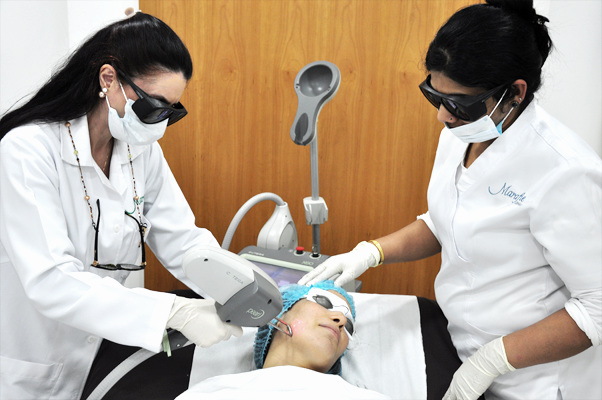 Pearl Fractional is a new, voluminizing, fractional laser that has been perfected for treating photo damaged skin (skin damaged by exposure to sunlight). It’s designed to improve brown spots and sun damage and to tone and texture the skin — resulting in a noticeably smoother and brighter complexion. Pearl Fractional can be used on the entire face and is particularly effective in treating the area around the eyes. and around the mouth areas, which often show the first signs of aging and can be the most challenging to treat. Most patients see significant improvement in about a week after only one treatment. Maximum results are visible in one to three months.